Practical Suggestions for Doing Justice: Do What You Love to Do! John Stoesz is executive director of Camp Mennoscah, a position he started in June, 2014. Previously he served as executive director of Mennonite Central Committee Central States from September 2005 through June 2013. 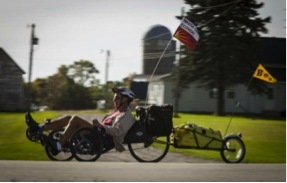 In between, he took time away from paid work to pursue two of his passions — riding his recumbent tricycle and Indigenous justice (particularly in his home state of Minnesota). I have two passions: riding my recumbent tricycle and Indigenous justice. A couple years ago I decided to combine them. First, a bit of introduction. In 2012, my family decided to sell my grandparents’ farm in Minnesota. My portion as one of the grandchildren was about 13 acres. Prior to white settlement, the land was Dakota homeland. Having learned about the Doctrine of Discovery and the resulting unjust benefits for white settlers and their descendants (like me), I asked my colleagues with the Indigenous Vision Center at Mennonite Central Committee Central States for help. With their assistance, I decided to “pay back” half the proceeds from the land sale to Indigenous groups working for land justice. The largest reparations amount went to a Dakota nonprofit group named “Makoce Ikikcupi” (“Land Recovery”). Now for the fun part. In the fall of 2013, I pedaled my tricycle 2,000 miles in southern Minnesota to raise awareness about what can and should be done to return Minnesota land to Dakota people. I went through 40 counties, and in each county I stopped at the newspaper office in the county seat. I tried to get an article with a picture of me on the trike! I didn’t always succeed, but I ended up getting 29 articles. My goal was 30, so I fell one short. Beginning last fall and in each year for the foreseeable future, I take two weeks’ leave from paid work to do education and fundraising among white Minnesotans for Dakota land return. On my trike, of course! I know most people are not into cycling. But you probably have something you love to do. Is there a way for you to combine your passion with working for Indigenous justice? The starting place is the place where you are and your own family history. Find out who lived there before white settlement. Where and how are these people today? If possible and appropriate, make contact and start relationships. Read. There are lots of good books. Two that rocked me are What does Justice Look Like: The Struggle for Liberation in Dakota Homeland by Waziyatawin and American Holocaust: The Conquest of the New World by David Stannard. Tell the truth about what happened and is happening. We white people have ignored these issues for too long. Teach your children, your children’s friends, and their teachers. Let’s fight back against “Lies My Teacher Told Me” (a book by James Loewen). Repudiate the Doctrine of Discovery. “This is my land?” Let’s release ourselves from a sense of entitlement to stolen land and try to develop a sense of fairness. Take down the symbols of racism. Let’s rename lots of things, like “Columbus Day,” “Redskins” teams, and “Custer” streets and parks. Make reparations. Pay a portion of real estate sales and “back rent” to Indigenous groups working for land justice. Those are seven practical suggestions to work for Indigenous justice. What do you love to do? How can you combine them? ← Dear God, My Ancestors Started a War! ?